After defeating Durango 2-1, Cougars celebrate with Desert Region Champions trophy at Betty Wilson Park on Saturday, Nov. 3. Photo courtesy of Ryan Daniel. Shortly after finishing a strong season 10-1-1, the men’s varsity soccer team played for the regional title and chance to battle for state. 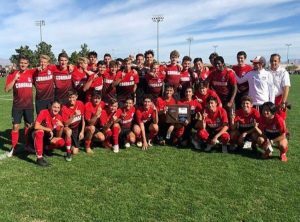 The Cougs defeated Durango and won the Desert Region title on Saturday, Nov. 3 before beating Eldorado 1-0 in the state quarterfinals on Thursday, Nov. 8 at Faith Lutheran. Junior goalkeeper Josue Ruiz made 10 saves to keep the Cougars in the game until sophomore Taye Adams was able to chip a ball into senior Alfredo Diaz to score the winning goal. 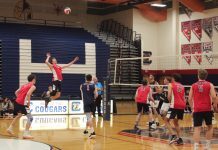 The Cougars played Spanish Springs in the state semifinals and won 2-1 on Friday, Nov. 9. 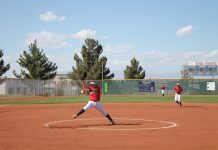 The Cougs then played Las Vegas at Bettye Wilson Park on Saturday, Nov. 10 in the final for the state championship title. Unfortunately the Cougars lost a tough battle losing 1-5 and finishing the season second in state.